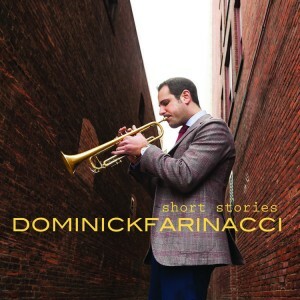 The CD Release Tour for New York City-based trumpeter, composer and educator Dominick Farinacci’s new album Short Stories comes to Bungalow Jazz on Sunday, October 23rd at 4pm. Suggested donation is $20, all of which goes to the performing musicians. Farinacci will be joined onstage by his NYC quintet: Dan Kaufman, piano; Jonathan Michel, bass; John Turner, drums; and Keita Ogawa, percussion. A Cleveland native, Farinacci serves as the Global Ambassador for Jazz at Lincoln Center, a position that has taken him all over the world, including a two-year stint in Qatar. His journeys and experiences had a strong influence on Short Stories, his Mack Avenue Records debut, which includes musical flavors spanning countries, generations, and styles. Keep reading for my thoughts on the album, as well as live videos. Produced by legendary producer and fellow Cleveland native Tommy LiPuma, Short Stories utilizes an all-star cast, including Christian McBride, Steve Gadd, Larry Goldings, Jacob Collier, Jamey Haddad, and Gil Goldstein, to cast a wide lens on universal and evergreen jazz sounds. Farinacci’s trumpet often leads the groove onward, but the overall vibe of the album is truly a team effort. With the album’s two lead vocal credits, multi-talented British YouTube sensation Collier has the most recognizable guest contributions, which are in themselves a fitting synopsis of the album’s scope. Collier picks up the lead from Farinacci on a buoyant and churning take on Horace Silver’s “Senor Blues,” and repeats the trick on “Somebody That I Used To Know,” a recent hit by Gotye. Tom Waits’ “A Soldier’s Things” is given a reverent, string-tinged treatment, and has also launched a monthly series covering Farinacci interacting with US soldiers to find better ways to support our veterans. The funky Middle Eastern groove of “Doha Blues” is a standout original tune, inspired by his time observing “the mix between Qatar’s conservative culture, modern architecture, and the multicultural population.” There is also a Latin contingent to the album’s makeup, as tunes like “Tango” and “Afternoon in Puebla” shuffle to a modern yet timeless rhythm.